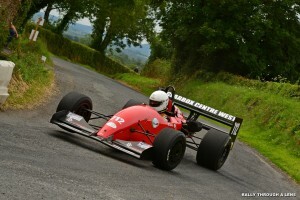 Rounds 8 and 9 of the Naylor Engineering Irish Hillclimb and Sprint Championship took place last weekend in Effin,Co. Limerick. The 2-day event, which was organised and run by the Limerick Motor Club under COC James O’Rourke, was a tremendous success with over 50 competitors on both the Saturday and the Sunday pushing hard for honours. On the Friday evening in the paddock there was much talk of rain for the next 2 days, and a lot of worried faces were to be seen. Howeve, Saturday morning brought sunshine and the sun tan lotion bottles were cracked open ! James and his team, true to their word, had the first car off for their practice run just before 11 A.M. This ontime start set the day up nicely, and along with that practice run there were 5 timed runs through the day – and indeed on both days, much to the delight of all competing. Galwayman Joe Courtney set the marker time on the first run in the ex-Dermot Nolan Reynard Peugeot F3 single seater, followed by Dublin’s Rory Stephens in his Radical SR8 and Wexfordman Jonny Mahon in his DJ ADS1. Martin Treacy in his Mitushbhi saloon car and Eanna Carroll in his Honda Civic saloon car, rounded out the top 5 after run . That’s pretty much how it stayed for the day, with each driver shaving tenths of a second off their times on each subsiquent run. Some of the most competitive and entertaining drives of the day undoubtedly came from class 1A, “The Cento Challenge” . This new budget class had no fewer than 14 competitors. The top 4 drivers, Billy White, Aidan Courtney, Gary Egan and Neill Bradbury, were fighting over 100ths of a second,with the newly-engaged Billy White coming out the victor. Overall fastest on the day was Joe Courtney who finished 4.87 seconds ahead of Rory Stephens, whilst best drive of the day went to Deirdre McKinley in her first Hillclimb/Sprint event since the passing of her husband, Irish hillclimb and sprint driver extraordinaire Simon McKinley. Deirdre was competing in a Vauxhall Nova saloon car – a new departure for her, having never competed in FWD before. Other class winners on the day included : 1A Deirdre Mc Kinley. 2 Jim Doherty. 3A Peter Bogan. 3B Eanna Carroll. 4 Mick O’Shea. 5 John Whitley. 6. Jonny Mahon. 7 Rory Stephens. 8 Georgie Bel, and 9 Donie Lucy. Day 2 of the event brought the rain heading our way and many competitors switched to wet tyres and a wet set up. Some competitors were seen cutting slicks into “Intermediate” tyres to help them gain that extra bit of car control and ultimately go that bit faster. However the rain didn’t actually arrive until late afternoon, by which time most folk had got a few quick runs in, and a good time on the board. Once again the top 4 remained the same, but a charging Stephens reduced the gap between himself and Courtney to just over 3 seconds – a good improvement on the Saturday times.Eanna Carroll reduced the gap between himself and Martin Treacy to an amazing 9/100ths of a second – not too bad for 2 cars that were originally built as family cars ! 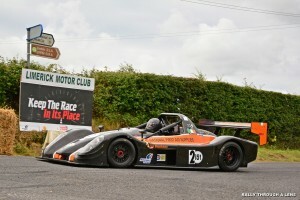 Rounding out the top 5 on Sunday was Robert Bell from Cavan, who pushed his Crosslee Busa hard to come home 5th. The CentoChallenge class once again provided marvellous entertainment with the top 4 remaining the same as the day before. However, they managed to go even faster than on Saturday, shaving almost 1/2 of a second off their fastest times. It was great to see so many BMW 3 series cars out in class 3B with Adare man Denis Hogan Jr coming out the victor amongst them, having battled hard with fellow Limerickman Adam Craughan. Also in the BMW brigade we saw Martin Flanagan, Ben O’Brien and Paul O’Connell. Class winners on the day : 1A Deirdre McKinley. 1B Billy White. 2 Jim Doherty. 3A Peter Bogan. 3B Eanna Carroll. 4 Mick O’Shea. 5 John Whitley. 6 Robert Bell. 7 Rory Stephens. 8 Georgie Bell and class 9 Thomas O’Rourke. Fastest driver of the day and overall fastest driver of the weekend went to championship contender Joe Courtney. Heading into rounds 9 and 10 at The Naul in North County Dublin on the weekend of Auguat 15th and 16th next, there is a 3- way tie at the top of the overall leaderboard with Robert Bell, Jonny Mahon and Joe Courtney all sharing 27 points. 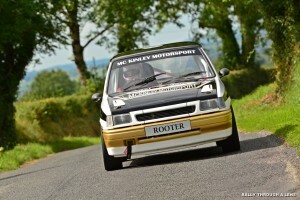 In the saloon car championship Eanna Carroll and Martin Treacy both share 39 points – another interesting battle ahead.